Kenyan born British Chris Froome is ‘devastated’ at being forced to withdraw from the Tour de France and flew home to Monaco on Wednesday evening for a period of rest and recuperation. Defending champion Froome abandoned the fifth stage 69km from home after crashing for the second time on the rain-sodden roads, and those falls came just 24 hours after he had injured his wrist in an early tumble at the start of stage four. The 29 year old had been sitting in seventh position when his latest accidents occurred, just two seconds back on race leader Vincenzo Nibali, and he is hugely disappointed to have been forced into an early exit. 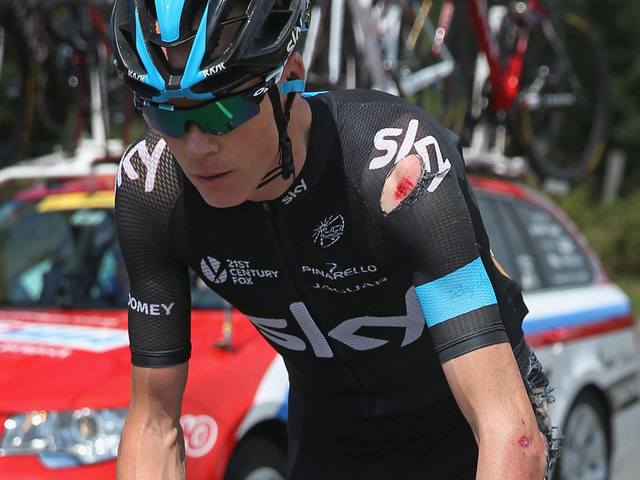 He told TeamSky.com: “I’m devastated to have to pull out of the race. It was the right thing to do after crashing again and I knew that I couldn’t carry on. “I’m going to fly home tonight and over the next few days I’ll go for some more scans on my wrist to find out exactly what injuries I’ve sustained. “The X-ray last night didn't show an obvious fracture and I wanted to race today, but clearly I was in pain and we put heavy strapping on the left wrist from the start. It’s too early to say for definite when I’ll be back on the bike, I’m just going to concentrate on getting back to full fitness. Froome who won bronze for Kenya in 2007 at the All Africa games for Kenya before switching nationality forced to withdraw Team doctor Alan Farrell came to Froome’s aid immediately after each fall, and was able to shed more light on the defending champion’s injuries. He said: “Chris first suffered a fall yesterday and landed on his left wrist. Initial X-rays were reassuring, but with the nature of the bones involved at the wrist, it was prudent to keep an open mind on any potential fracture that might not have been evident straight away. “Chris underwent appropriate medical treatment last night, and again this morning, and he was able to start today’s stage. “Unfortunately, due to the nature and location of Chris's injury, it made controlling the bike difficult, and with the treacherous conditions, the decision was taken between Chris and I to withdraw from the race. Before Froome left for home, he took time to praise Team Sky’s staff and riders and believes Richie Porte will be a more-than able replacement as team leader. He added: "They’ve shown they are ready to get behind Richie, who’s in excellent form, and I would like to wish everyone all the best. I’ll certainly be cheering them on"